EXTRAMEL® is known as "THE ORIGINAL MELON SOD (SUPEROXIDE DISMUTASE)" and is derived from a rare species of melon grown in the southern region of France. 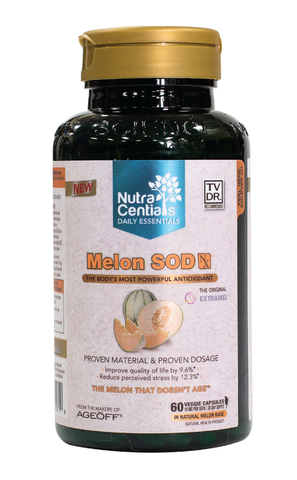 SOD is the body’s first line of defense against the most damaging free radicals. Provides antioxidants for the maintenance of good health. Supports positive effects on perceived stress such as pain, sleep troubles, weariness, and irritability. Accept no substitute, Demand Melon SOD! Non-medicinal: Vegetarian capsule (Hydroxypropyl Methylcellulose) and Silica. Supports positive effects on perceived stress such as pain, sleep troubles, weariness and irritability. NutraCentials Health Sciences Inc. in Canada is North America's #1 research-based manufacturer of landmark nutritional supplement brands that have been developed for a unique set of customers searching for optimal quality, safety and effectiveness. Nutraceutical, Nutricosmetic, and Cosmeceutical brands are designed to address today's major health and appearance concerns using clinically proven ingredients backed by one or more published clinical research studies. NutraCentials was established in 2006 by Ryan Foley after 10 years of corporate research and development experience in the nutraceutical industry. Ryan's goal is to continually produce science-based health solutions utilizing advanced patented ingredient research so that our customers look and feel their very best.